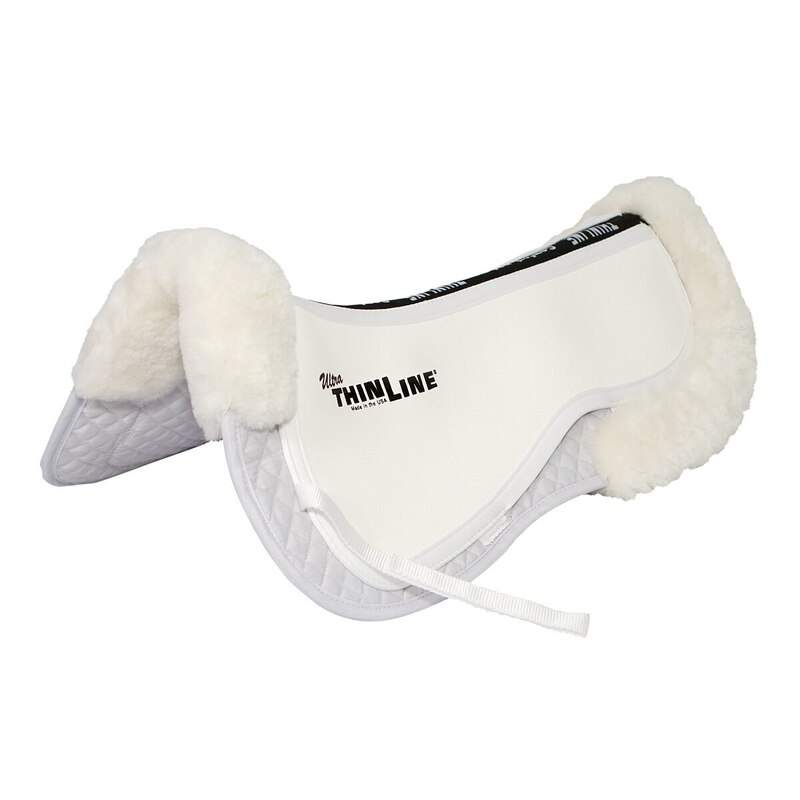 The Ultra Thinline Trifecta Cotton Half Pad with Sheepskin Rolls is perfect for riders that prefer fit, function, and fashion in a saddle pad. 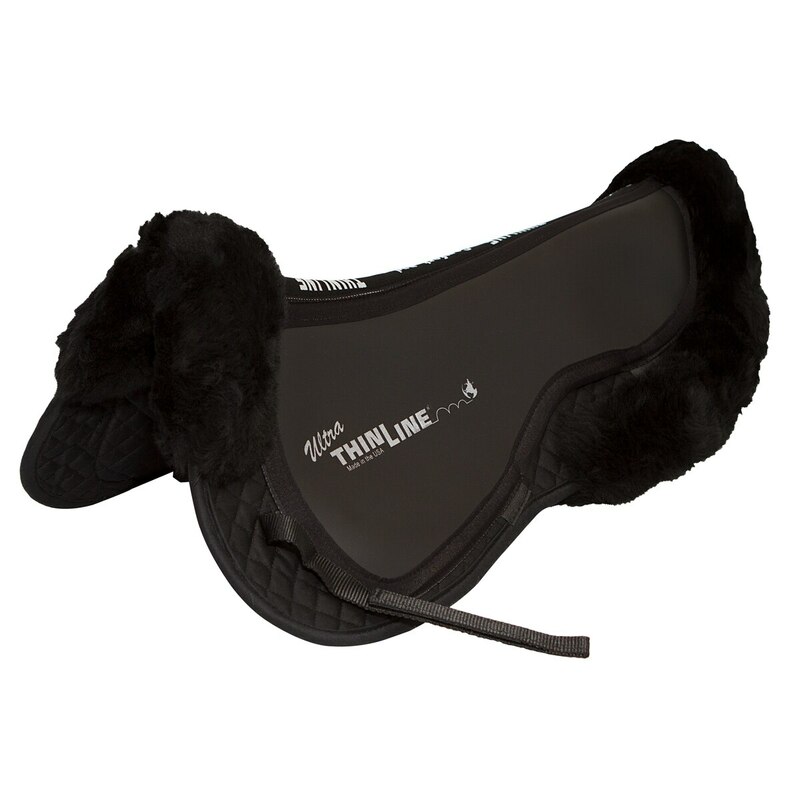 ThinLine developed this pad to give riders the fashion appeal of sheepskin and the shock absorption they and their horses need without the bulk, high maintenance or cost of a full sheepskin pad. Coordinate with ThinLine Shims for Trifecta and Sheepskin Comfort Half Pads. Pockets for shims allow for minor saddle fitting adjustments. Spine Measurement: Med - 18.5"" Large - 20"
Cotton Comfort Pads – Simple machine wash: cold water and mild detergent (you may bleach the whites). Use a mild/gentle cycle. Hang to dry. Medium: measures 18.5" between the rolls and 24" including the rolls. Spine Measurement Med - 18.5"" Large - 20"
Special Features Fashion appeal of sheepskin while providing a sleek design and shock absorption without the bulk. 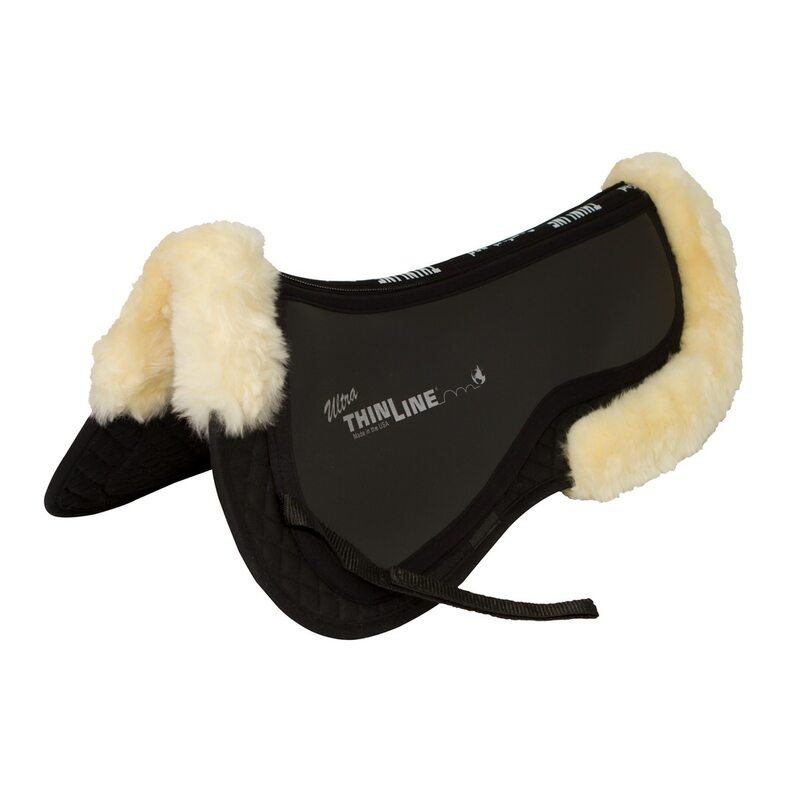 ThinLine Trifecta Cotton Half Pad with Sheepskin Rolls is rated 4.8 out of 5 by 114. Rated 5 out of 5 by Alex from So Happy I decided a month ago to splurge and finally buy this halfpad to replace my thicker wool one, which I had been wanting to do for a while. I am so glad that I did. Not only is it beautiful, but it fits under my saddle so well while also providing protection. Since I started using this halfpad, my mare is more willing to let me into her back and stretch down into the contact. I couldn’t be happier. Rated 4 out of 5 by AZDressageRider from Nice Halfpad! Have only had this halfpad for few weeks, so cannot speak to product longevity, but it appears to be well made and nice quality. Rated 5 out of 5 by ashcan7 from I bought this halfpad for a horse that had tended to get a sore back when he was showing as a hunter (with no half pad), and had been going in an ogilvy for a few years. I wanted something more low profile, since my saddle is custom made for him and me. I liked this since i had had good luck with thin line products on a previous horse, and i liked the idea of the sheepskin rolls, since it would make it look more appropriate and high quality for showing on the circuit. So far, I love it! he hasn't had any back soreness whatsoever, and the pad is beautiful. I have a 17" saddle and the medium fits quite well, it could be a tad smaller to fit more snugly, but if i sit my saddle right, you can't even notice, and it looks perfect! I am looking into purchasing the version of this pad without sheepskin rolls to use for schooling and the other horses several horses I ride so I don't ruin the sheepskin for my own horse to show in. Overall, I am very happy with this pad and would recommend highly!! Rated 5 out of 5 by Lucygoose from Great for Saddle Fit I bought this for a new saddle that sat too wide on my TB cross with "shark fin" withers. I ended up getting (2) 1/4" shims for the front pocket so it lifts it off his wither. I've been using for about 2 weeks now and I love how my horse is going. Generally very lazy animal and I've been surprised with how forward he moves with this new setup. Major improvement in our dressage work, used to flip his head and not want to move in the sitting trot and now I'm getting bounced out of the tack. Would recommend for anyone dealing with a saddle fit issue as you can customize the fit with this pad!! Good investment for my horse. Rated 5 out of 5 by BFH912 from Perfect Fit! I read the reviews extensively prior to purchasing, and am happy I did. The (M) fits my horse and saddle perfectly. I have an 18" saddle, and the rolls fit snugly at the front and back. My horse is happy and my trainer wants one now, too! Rated 5 out of 5 by Dixies KT from Love it! My granddaughter and her pony are enjoying this half pad! Rated 5 out of 5 by Bhall99 from Wonder Pad I have been using this pad for over a year now and I have no bad things to say about it! My gelding had back soreness (We have a custom saddle, and vet came to look) before getting this pad, and now he moves, feels, and preforms better. I can ride with a peace of mind knowing that he (and me too!) are comfortable. The care for this pad is pretty easy, just take a soft brush to it after your ride and let all the moisture dry before putting it away. I haven't had any problems! Rated 5 out of 5 by Jenn from Nice Pad! I have a saddle that is slightly too wide for my horse. So I bought the Trifecta half pad with the front shims and my gelding is so much happier!! Rated 5 out of 5 by Paris from Fantastic Half Pad I've so far had this half pad for 3 weeks (I use it 5 days a week) and I love it!!! Both my vet and saddle fitter hate Ogilvy pads and recommended I get this one instead. Things I love: 1) Looks good 2) It's easy to wash 3) Has a channel for the spine - many others don't have this feature 3) It really is a nice and thin pad, but looks fancy and substantial with the sheepskin rolls 5) It's shimmable 6) So far in the LA summer heat when I take my tack off after an hour's ride, my guy's back has a light/normal amount of sweat, not excessive like I was expecting with the extra layer A common complaint I found in customer reviews is that this half pad runs large and people's saddles swim in it. I have a 16.5" Antares and the Medium fits great. It's slightly longer than my saddle pad, causing the back to get a little dirty from contact with my horse. But lately I've been positioning the halfpad/saddle closer to the front of my saddle pad and that seems to do the trick. Rated 5 out of 5 by AWM1922 from ALL AROUND AWESOME!! I love this half pad! My saddle is a little wide for my horses and this helps keep my pals comfy. Also it is shimmable so if I ride a narrow horse it can be easily adjusted to fit them. This half pad is also super easy to clean just throw it in the wash on a gentle cycle with extra water and while it is drying brush the fluff with a brush so it stays fluffy! A size medium works great on my17.5 stubben jump saddle!